For nearly six months now and a total of 155 games, the Minnesota Twins have managed to keep themselves in the thick of the American League Central. A recent hot streak in the past week or two has propelled the club to an 81-74 record with one week remaining in the regular season. From the time the season starts in late February with spring training to the time the real season kicks off in the first days of April and then finally until all 162 games are completed, each team plays almost every day for a chance. Teams play for a chance, a chance to be in the type of situation that the Twins find themselves in on their trip to Detroit. Some teams lock up a playoff berth well before the final week, many others lock up a look ahead to the next season well before that. Some others aren’t lucky enough to have their playoff ticket stamped, but they are lucky to be playing for more of a reason than just counting down the days until off-season golf. The Twins are one of those few teams. While the Los Angeles Angels, Boston Red Sox and New York Yankees rest and align themselves for their first playoff series, the Minnesota Twins find themselves entering Detroit trailing by two games with a chance to leave on Thursday night leading the division, tied for the division lead, or in a worst case scenario, eliminated from the division. There is no doubt that the Twins would much rather be setting up their rotation for the first games of the American League Divisional Series, but they are lucky nonetheless. They’re lucky to be playing for something and to have a chance; no matter how difficult the outlook may seem. Come Friday when the Twins kick off their final regular season series at the Metrodome, they could be playing for their season or playing to finish up a long, 162 game year before heading to the warm weather down south. Whatever may happen, the Twins have made it to the final week still alive. For the next four days, the team will have what many others would love to have at this point: a chance. Today marks a unique day in history as the date, September 9, 2009 transforms to 09/09/09. It’ll happen again next October, again two years from now in November, and then again three years from now in December. After that moment, it’ll be many years before the day, month and year match up again. To commemorate the unique day in history, we take a look at the list of all players to ever where number nine for the Minnesota Twins. Two people, A.J. Pierzynski and Steve Liddle, stand out to the general fan, and Liddle has held the uniform for the longest time, followed closely by Gene Larkin who wore it for six seasons. Charlie Manuel too is a familiar name; he has since become the manager for the Philadelphia Phillies and led them to a World Series title last season. For more than a week, the Minnesota Twins worked at cutting down Detroit’s division lead. With series victories and key losses by Detroit, the Twins managed to work themselves into second place and within 3.5 games of the Tigers with one month remaining. A blown save on Wednesday followed by a Tigers victory on Thursday and another Twins loss on Friday, and what looked like a team on the rise turned into a team moving in reverse. A few difficult losses coupled with a Tiger’s winning streak, and over the span of three days the Twins went from a reasonable window to a six game deficit with under 30 games remaining. The Twins found out firsthand last season that one game does make a difference. A streak of poor baseball in the final weeks of August kept the team from making a move, and a one-game playoff loss to the Chicago White Sox left players and fans wondering what went wrong. This season the Twins have learned about inconsistency. While Joe Mauer has put forth a historic season and Jason Kubel has made a breakthrough, inconsistency has kept the Twins around the .500 mark through five months. The Twins find themselves scratching to stay alive with just under four weeks and 30 games remaining on the 2009 schedule. Until the playoff vision is gone however, you can bet the team won’t give up. But any sort of surge will need to begin immediately. The Twins have seven remaining meetings with the Tigers, and those meetings are what provide life. Back in ’06 the Twins found out what a late surge can do, last season they learned what one game can do, and this season they’ve learned all about inconsistency. Baseball is a crazy game, and the Twins have seen it all first hand. As Kirby Puckett once said, anything is possible. Through the first two months of the season, Scott Baker’s performances only led to questions about his newly signed 4-year, $15.25 million contract inked in the off-season. Three months later, the pitcher that earned the deal with a tremendous 2008 season is beginning to reappear. With his most recent one run, six inning performance in Cleveland, Baker moved to 13-7 on the season with an ERA of 4.34 – a decent mark considering the rough start to the season back in April. After three starts and the first month of the season, Baker was 0-3 with a 9.82 ERA. The right-handed Baker lasted only 14.2 innings over the course of those three starts and hitters hit a combined .328 against him. May was better for Baker, but in six starts in the season’s second month, he posted an ERA of 4.97, and his cumulative ERA stood at 6.38. After nine starts, Baker was still searching for an answer, and nearing the end of the line and staring the bullpen in the face, Baker finally changed for the better. In the three months since Baker neared a move to the bullpen, he has posted a solid 3.42 ERA. The numbers date back to June 1, and span a total of 18 starts. Take out one poor outing against the New York Yankees on July 7 (3 innings, 5 runs), and Baker has posted a 3.11 ERA over the past three months. Since the All-Star Break, Baker has been even more impressive. He has went 6-0 over the course of ten starts while posting a 2.64 ERA and an opponents batting average of .218 in the second half. Baker has not lost in his last 11 starts, and is 7-0 with a 3.04 ERA in that span. A poor start to the season raised eyebrows and questions about Baker’s future. The three months since have made Baker’s off-season extension look like a brilliant move. Baker could be with the organization through 2013, and if his recent ways are a preview of the future, the Twins might indeed have an ace in the rotation. 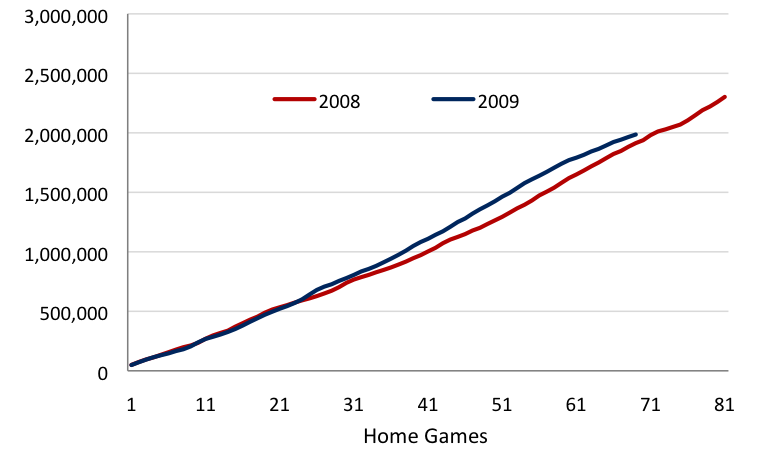 Through 54 home games, the Minnesota Twins were averaging 29,212 fans per game, about 3,500 more fans per game than last season at the same point. Over the past month, and a total of 15 games, the team’s pace to break last season’s attendance mark has dipped. After 69 home games, the Twins have drawn a total of 1,985,948 fans to give them an average of 28,782 fans per game. The average is still above where the team was last season at the same point, but the margin has gone from 3,371 more fans per game after 54 home�matches�to only a 1,049 fans per game difference 15 home games later. To meet the league average for attendance, which is set to be on pace for about 2,400,000, the Twins must draw 34,504 fans per game in the final month. Beating last season’s mark still looks doable, but meeting the league attendance average won’t be an easy task. In a year in which the Minnesota Twins will play their final games in the Metrodome, it’s hard not to often think back about the games you attended, the moments you watched, and the feats that were accomplished under the roof and on the turf. No matter how great it would have been to sit outdoors on the days with great weather, the Metrodome, and the player’s who took the field over the 28 years of baseball indoors have left a mark that will not soon be forgotten when Target Field is finally open. As the Twins look to make the playoffs, and wait to take the field in Cleveland looking to wipe a gut-wrenching loss from their minds, here is a video of one of the best players to step foot on the Metrodome ground. The Minnesota Twins will never again play the Chicago White Sox in the Metrodome. After dominating the team from the South Side of Chicago in recent years under the roof, the two sides will never again face�each other�indoors after they finished up their final scheduled series in Minneapolis for the 2009 season. The Twins ended the season with a 7-2 home record against the White Sox, and the two losses came by a combined three runs. From the beginning of last season, the Twins went 15-3 (.833) at home against the White Sox. Dating back to the ’07 season, the Twins went 20-7 (.741), and all the way back to the magical ’06 season, they went 25-11 (.694). The�dominance�at the Metrodome against one of the team’s biggest rivals has been well documented, but it will be no more. If there is any home�dominance�for the Twins against one of their biggest foes, it’ll need to come outside at Target Field. The Twins time and time again in recent seasons have been the team to collect the walk off victories. They’ve seen Alexi Casilla jump down the first base line, and Jose Morales get mobbed. They’ve seen Joe Nathan dominate the ninth, and the Sox rarely had much to celebrate. With one more opportunity however, the White Sox got the last laugh in Minneapolis. Getting within one pitch of a second sweep of the White Sox and further advancement above the .500 mark is devastating, and feels like a punch to the gut; it’d be difficult to find a more difficult loss to swallow. The Twins could drop back in the division tonight, but the season is not over. With 30 games remaining, including 7 against the Detroit Tigers, the Twins must bounce back as they head to Cleveland this weekend. An extended downfall could doom the hopes of adding to the list of Metrodome Memories.